R4 and R5 are uplinks to the Internet, redistributing their default route. Behind R1 there are some more networks coming in via EIGRP, which are redistributed as well. A summary address at R1 is used just for test purposes. It shows up in the routing table as an “is a summary” route with an exit interface of Null0. All routers running IOS version 15.1(4)M12a. R4 and R5 are Cisco 2851 routers, while R1 is a 2811. Here is the pcapng file (zipped). I used my ProfiShark 1G for capturing it in front of R1, interface fa0/0. Have a look, for example, on packet number 9, LS Update, which shows some LSAs of type 5 “AS-External-LSA” advertising the default route among others. 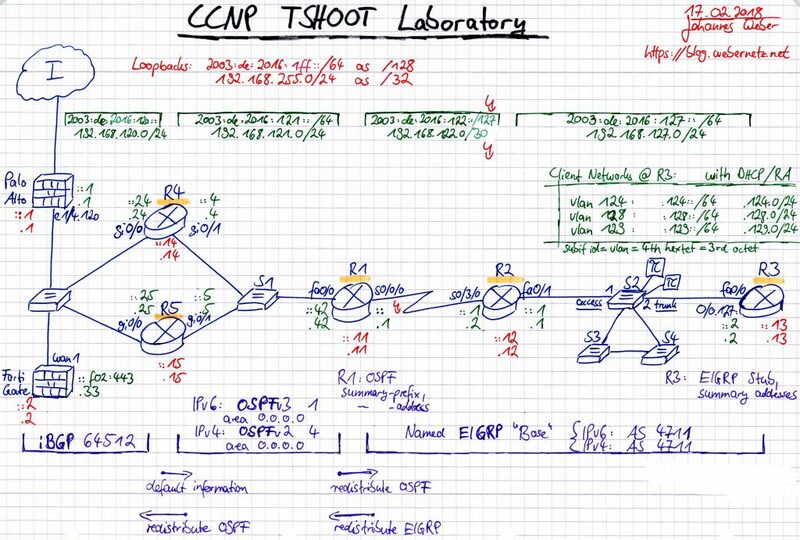 Note that OSPF is no TCP/UDP protocol but an own IP protocol with number 89, refer to the IANA Protocol Numbers. Routing Protocol is "ospf 4"
Featured image “Rec” by Jean-Maki Simon is licensed under CC BY-ND 2.0.